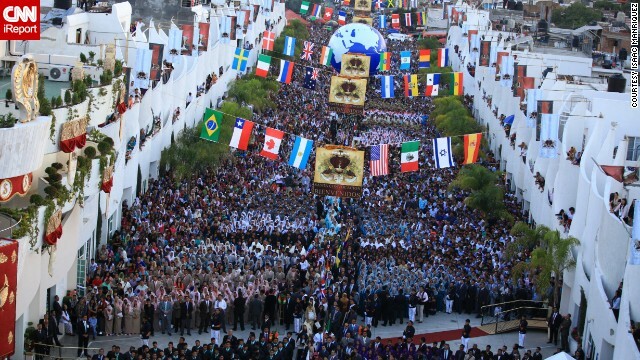 Crowds of worshipers who had traveled to the country from as far afield as Israel spill out into the city’s streets, holding parades and festivities that go on for days.The event reaches its peak Wednesday when the actual holy supper celebration is held in the church’s main building in Hermosa Provincia in Guadalajara. The supper, says church member Isaac Manriquez, represents “the maximum expression of faith” for worshipers attending the event. Manriquez, from Deming, New Mexico, where the organization has a congregation, says he has been helping out at the ceremonies since he was small. He sent in these images of the church’s members parading down the main thoroughfare called the Calzada, which leads to the main temple. Sharing photos of his fellow church members was, for Manriquez, a chance to inform others about his faith. For him, the event is about reuniting with international friends and reaffirming his commitment to his religion. “The event is very important for me and for those who share this faith,” he said. AND WHAT HAPPENS WITH YOUR CHILD WHEN HUMAN RAZE ORGs STUDIE EAT IN ITS COFFINS.